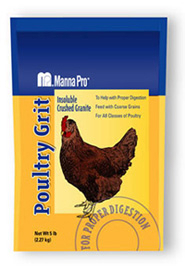 Insoluble crushed granite for all classes of poultry that helps with proper digestion. Helps with proper digestion. Designed to be fed with coarse grains. Feed free choice in a separate feeder, or mix 1 pound with 40 pounds of feed. Provide to poultry fed Scratch or other coarse grains beginning at 8 weeks of age.